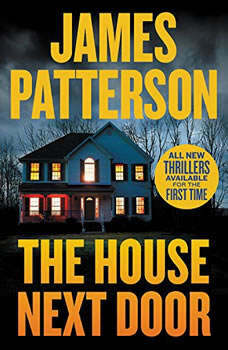 THE WORLD'S #1 BESTSELLING WRITER - 3 pulse-pounding thrillers in 1 book! The House Next Door (with Susan DiLallo): Married mother of three Laura Sherman was thrilled when her new neighbor invited her on some errands. But a few quick tasks became a long lunch-and now things could go too far with a man who isn't what he seems....The Killer's Wife (with Max DiLallo): Four girls have gone missing. Detective McGrath knows the only way to find them is to get close to the suspect's wife...maybe too closeWe. Are. Not. Alone (with Tim Arnold): The first message from space. It will change the world. It's first contact. Undeniable proof of alien life. Disgraced Air Force scientist Robert Barnett found it. Now he's the target of a desperate nationwide manhunt-and Earth's future hangs in the balance.The House Next Door (with Susan DiLallo): Married mother of three Laura Sherman was thrilled when her new neighbor invited her on some errands. But a few quick tasks became a long lunch-and now things could go too far with a man who isn't what he seems....The Killer's Wife (with Max DiLallo): Four girls have gone missing. Detective McGrath knows the only way to find them is to get close to the suspect's wife...maybe too closeWe. Are. Not. Alone (with Tim Arnold): The first message from space. It will change the world. It's first contact. Undeniable proof of alien life. Disgraced Air Force scientist Robert Barnett found it. Now he's the target of a desperate nationwide manhunt-and Earth's future hangs in the balance.